I am starting to think that there is a correlation between how far I am from the Market Square and how happy I am with my dining experiences. I had an excellent time at the Black Bull at Blidworth, and last night I somehow managed to put a second excellent experience back-to-back with it. Siam House might be located next to a scruffy laundrette and newsagency at the back end of West Bridgford, facing the stomach-turning frontage of a Hungry Horse pub, but don’t let that put you off. The decor inside is lovely, the ambience peaceful, and the food utterly and totally sublime. We were the only customers when we arrived, unwittingly earning ourselves 10% off our bill for commencing our chowfest between 5 and 7 pm on a school night. We were greeted by Ting, who runs the restaurant, a thoroughly pleasant and attentive host. We were given an ample wine list to peruse, but planned drinks later at new bar Cured put paid to that. The husband had a Singha beer (£2.90 for a standard bottle) and we cracked on with the menu. Eschewing the set menu options, we were then left with a substantial array choice from the full menu. The specialities section piqued our interest and we ended up splitting a Som Tom (£5.95) alongside our main courses. This is a fiery salad of exotic fruit, baby tomatoes, green beans, carrots, bean sprouts and a hefty sprinkling of crunchy peanut pieces. The magic is in the dressing, and this dressing was magical. It was certainly packed an initial flavour, before becoming hotter at the end of the mouthful, but without numbing the tastebuds. It was presented beautifully, a really flamboyant display of colour that did not disappoint in its taste. I ordered the Tofu Gra Prao (£6.95), having reassured Ting that I understood that it would be pretty darn hot. This was another vibrant dish, it had a heat very different from the Som Tom and a sauce dense and oily. I enjoy the preparation of tofu in Thai cuisine: crunchy and squidgy as opposed to slippery and silken. 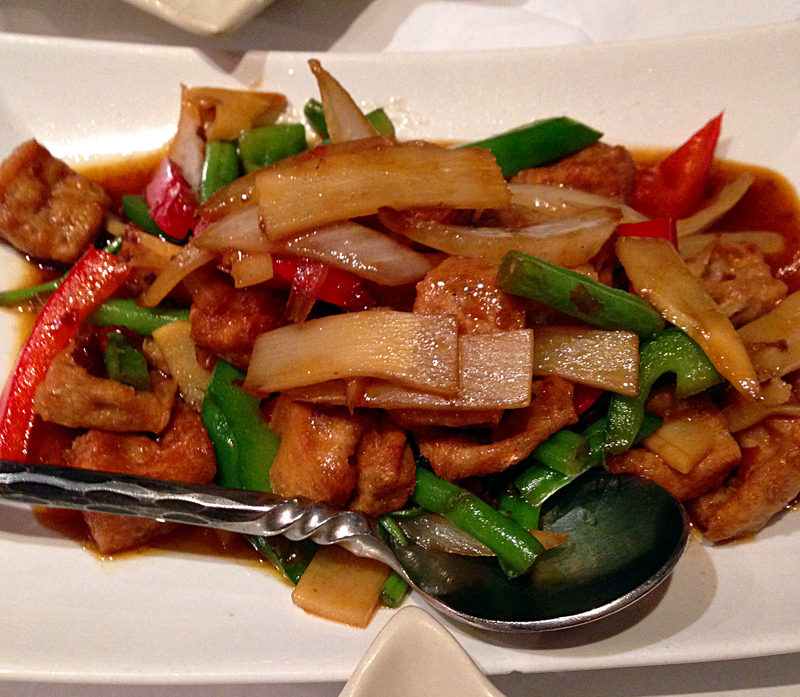 The bamboo, beans and peppers accompanying the tofu were all firm and fresh. A heavenly dish. The husband plumped for Pla Goong (£8.95), a milder prawn dish that came amply piled with very happy, meaty, curly pink prawns. He was glad to have ordered some steamed rice (£2.00) to soothe his slightly less mental palate, although despite the heat he insisted on finishing off the dressing left on my pretty bare plate. His food was so good he forgot he had half a beer left. That is a ringing endorsement. The service was excellent, incredibly polite and gentile. The bill was an impressive £25 for three dishes, rice, and two drinks. We spent most of the meal discussing what options we would go for next time, which I suspect will be next Monday. This is a great place for all sorts of occasions and vegetarians are particularly well catered for. Go with a sense of adventure – there’s many treasures to be found. Dear Sarah, It was a great pleasure serving you. We’re delighted that you and your husband enjoyed the dining experience of our Thai cuisine and venue. 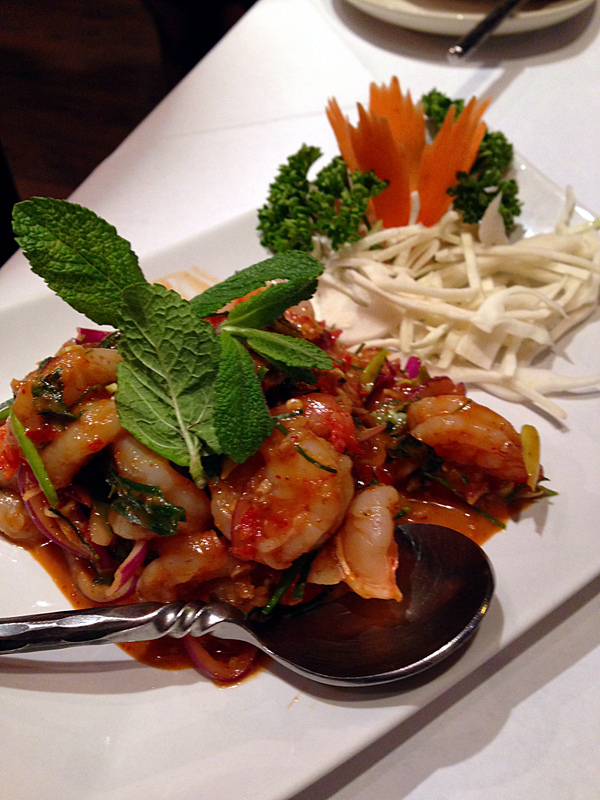 At Siam House we take pride in our authentic Thai cuisine and relaxing atmosphere. 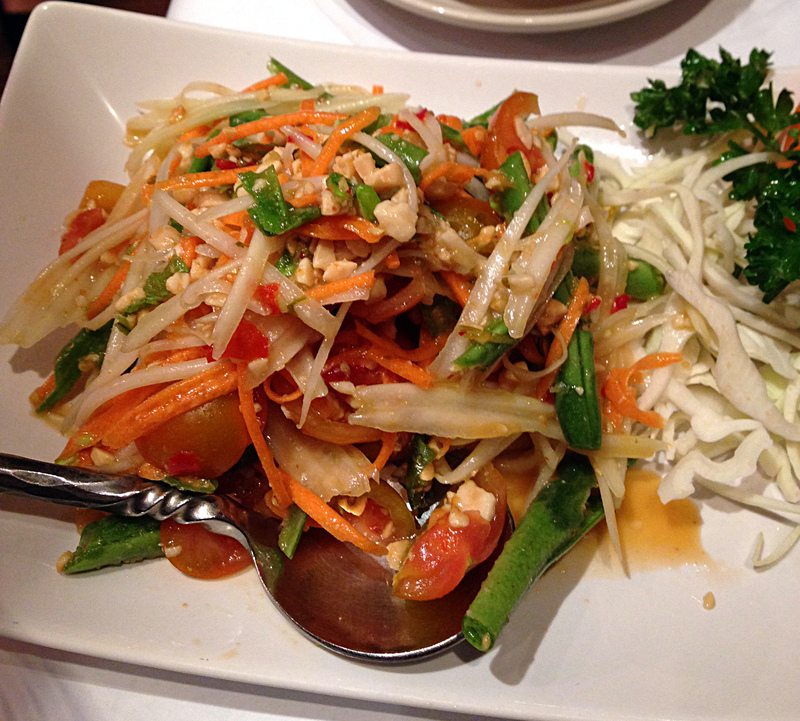 It’s our mission to serve fresh, fragrant and authentically Thai cuisine. Looking forward to welcoming you again. Thank you.